Gifts giving is a way of telling that you really care for the requisite person. When we gift something to our dear ones, we get something very special i.e. a smile on their faces. These valuable sources of emotions are packed by gift paper, which varies throughout the globe. In western world, the gifts are often covered in beautiful wrapping paper accompanied by sweet gift note, whereas Chinese wrap gifts in red wrapping. Today, giving gifts has now become the vital part of human interaction. Whenever we present gifts to dear ones, we show interest, appreciation, and gratitude to them. A gift should be impressive in itself, whether you are presenting them on birthday, anniversary, wedding, or any other occasion a gift should complement the celebration rightly. 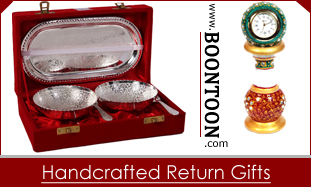 Boontoon, has the wide range of online Indian Handicrafts, décor and other gifts. We have created a pictorial representation that tells the importance of return gifts and depicts different ideas of presenting return gifts.